Spills could result in electric shock. Fisher & Paykel is recalling some electric cooktop models due to the risk of electric shock. These cooktops may not be earthed effectively, creating the risk of an electric shock if spills around the control panel and dials leak into the electrical components. The affected models have been sold since 2011. Model numbers start with CE604CB, CE604LB or CE905CB, with serial number range beginning with 1, 2, 3, 4, BK, BL, BU, BY, EF, EI, ES. The model and serial number can be found on the back of your User Guide. 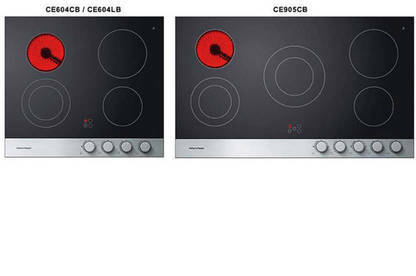 These are electric cooktops with a ceramic glass cooking surface and the control panel and dials at the front right. A small internal repair is required to ensure a failsafe earth and remove the risk. Call 0800 004 921 (Monday-Friday 8am-9pm, Saturday 9am-4pm) to confirm your cooktop needs a repair.